One thing is for sure in dog training – and in behaviour modification…nobody ever gets every rep, every interaction, all timing correct. The way you train tends to have a lot to do with the impact this will have. If you’re busy building the behaviour you’d prefer to see from your dog, then you’re probably using a lot of positive reinforcement (and most likely negative punishment). Mistime a repetition and it’s barely likely to have an impact overall. If you’re using positive punishment (and most likely negative reinforcement) then the nature of those operant forces mean the contingencies are greater. Whichever operant forces you’re using on any given day, and for any given exercise (and you should be making an intelligent choice between all 4 options based on their relative merits) it’s important you pick your criteria well. Don’t rush – don’t push too far by being lazy and skipping steps. Don’t assume your dogs smarts will get you through. Instead, focus on making your training smart. 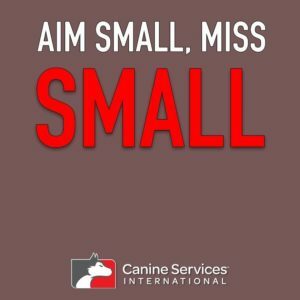 Break it all down into small goals for the dog to reach. The smaller you aim with your criteria, the less likely you are to overstep and sabotage your training process.